Structure of a microtubule. The ring shape depicts a microtubule in cross-section, showing the 13 protofilaments surrounding a hollow centre. Microtubules are a component of the cytoskeleton, found throughout the cytoplasm. These tubular polymers of tubulin can grow as long as 50 micrometres, with an average length of 25 µm, and are highly dynamic. The outer diameter of a microtubule is about 24 nm while the inner diameter is about 12 nm. They are found in eukaryotic cells and are formed by the polymerization of a dimer of two globular proteins, alpha and beta tubulin. Microtubules are very important in a number of cellular processes. They are involved in maintaining the structure of the cell and, together with dynein and kinesin). They are also involved in cell division (mitosis and meiosis), including the formation of mitotic spindles, which are used to pull apart eukaryotic chromosomes. Microtubules are centrosome or the basal bodies found in cilia and flagella. These MTOCs may or may not possess centrioles. There are many proteins that bind to microtubules, including motor proteins such as kinesin and dynein, severing proteins like katanin, and other proteins important for regulating microtubule dynamics. 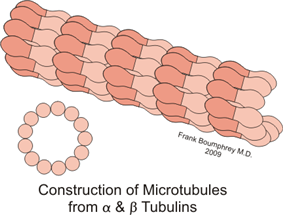 Microtubules are long, hollow cylinders made up of polymerised α- and β-tubulin dimers. The tubulin dimers polymerize end to end in protofilaments, which are the building-blocks for the microtubule structure. Thirteen protofilaments associate laterally to form a single microtubule and this structure can then extend by the addition of more protofilaments. In order for polymerization to occur, dimers must be present at a concentration above a specific minimum called the critical concentration, although the process is accelerated by the addition of nuclei, which are lengthened. Microtubules have a distinct polarity that is important for their biological function. Tubulin polymerizes end to end, with the α-subunits of one tubulin dimer contacting the β-subunits of the next. Therefore, in a protofilament, one end will have the α-subunits exposed while the other end will have the β-subunits exposed. These ends are designated the (−) and (+) ends, respectively. The protofilaments bundle parallel to one another, so, in a microtubule, there is one end, the (+) end, with only β-subunits exposed, while the other end, the (−) end, has only α-subunits exposed. Elongation of microtubules typically only occurs from the (+) end. The lateral association of the protofilaments generates an imperfect helix with one turn of the helix containing 13 tubulin dimers, each from a different protofilament. The image at the top of this article illustrates a small section of a microtubule, a few αβ dimers in length. The number of protofilaments can vary; microtubules made up of 14 protofilaments have been seen in vitro. Microtubules are part of a structural network (the cytoskeleton) within the cell's cytoplasm. The primary role of the microtubule cytoskeleton is mechanical support, although microtubules also take part in many other processes. A microtubule is capable of growing and shrinking in order to generate force, and there are motor proteins that allow organelles and other cellular components to be carried along a microtubule. This combination of roles makes microtubules important for organizing cell layout. Microtubules are typically cilium or flagellum are typically termed basal bodies; otherwise MTOCs are called centrioles. In many cell types, microtubules are nucleated primarily at MTOCs; however, there are many exceptions to this rule. Microtubules have a major structural role in eukaryotic cilia and flagella. Cilia and flagella always extend directly from a MTOC, in this case termed the basal body. The action of motor proteins on the various microtubule strands that run along a cilium or flagellum allows the organelle to bend and generate force for swimming, moving extracellular material, and other roles. Prokaryotes do not possess tubulin or microtubules. Prokaryotic (both bacterial and archaeal) flagella are entirely different in structure from eukaryotic flagella. This diagram depicts the organization of a typical mitotic spindle found in animal cells. Chromosomes are attached to kinetochore microtubules via a multiprotein complex called the microtubule organizing center. A notable structure involving microtubules is the mitotic spindle, used by most eukaryotic cells to segregate their chromosomes correctly during cell division. The mitotic spindle includes the spindle microtubules, microtubule-associated proteins (MAPs), and the MTOC. The microtubules originate in the MTOC and fan out into the cell; each cell has two MTOCs, as shown in the diagram. The process of mitosis is facilitated by three main subgroups of microtubules, known as astral, polar, and kinetochore microtubules. An astral microtubule is a microtubule originating from the MTOC that does not connect to a chromosome. Astral microtubules instead interact with the cytoskeleton near the cell membrane and function in concert with specialized dynein motors, which pull the MTOC toward the cell membrane, thus assisting in correct positioning and orientation of the entire apparatus. Kinetochore microtubules directly connect to the chromosomes, at the kinetochores. To clarify the terminology, each chromosome has two chromatids, and each chromatid has a kinetochore; the two kinetochores are linked. The complex created by the two kinetochores on a chromosome is called the centromere. Polar microtubules extend from one MTOC and intertwine with the microtubules from the other MTOC; motor proteins then make them push against each other and assist in the separation of the two daughter cells. Cell division in a typical eukaryote finishes with the generation of a final cytoplasmic bridge between the two daughter cells termed the midbody. This structure is built of microtubules that originally made up part of the mitotic spindle. Some cell types, such as plant cells, do not contain MTOCs. 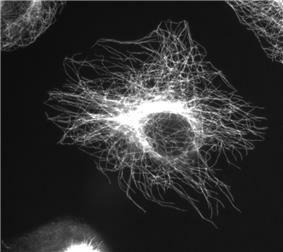 In these cells, microtubules are nucleated from discrete sites in the cytoplasm. Other cell types, such as trypanosomatid parasites, have a MTOC but it is permanently found at the base of a flagellum. Nucleation of microtubules for structural roles and for generation of the mitotic spindle is not from a canonical centriole-like MTOC. The regulation of the microtubule cytoskeleton in these cells is an intense area of study. Dynamic instability refers to the coexistence of assembly and disassembly at the (+) end of a microtubule. The microtubule can dynamically switch between growing and shrinking phases in this region. During polymerization, both the α- and β-subunits of the tubulin dimer are bound to a molecule of GTP. The GTP bound to α-tubulin is stable and it plays a structural function in this bound state. However, the GTP bound to β-tubulin may be hydrolyzed to GDP shortly after assembly resulting in the addition of new dimers. The kinetics of GDP-tubulin are different from those of GTP-tubulin as GDP-tubulin is prone to depolymerization. A GDP-bound tubulin subunit at the tip of a microtubule will fall off, although a GDP-bound tubulin in the middle of a microtubule cannot spontaneously pop out. Since tubulin adds onto the end of the microtubule only in the GTP-bound state, there is a cap of GTP-bound tubulin at the tip of the microtubule, protecting it from disassembly. When hydrolysis catches up to the tip of the microtubule, it begins a rapid depolymerization and shrinkage. This switch from growth to shrinking is called a catastrophe. GTP-bound tubulin can begin adding to the tip of the microtubule again, providing a new cap and protecting the microtubule from shrinking. This is referred to as "rescue". Microtubule plus ends are often localized to particular structures. As mentioned previously, they are found at kinetochores and used to pull chromosomes apart during mitosis. In polarized interphase cells, microtubules are disproportionately oriented from the MTOC toward the site of polarity, such as the leading edge of migrating fibroblasts. This configuration is thought to help deliver microtubule-bound vesicles from the Golgi to the site of polarity. In 1986, Marc Kirschner and Tim Mitchison proposed that microtubules used their dynamic properties of growth and shrinkage at their plus ends to probe the three dimensional space of the cell. Plus ends that encounter kinetochores or sites of polarity become captured and no longer display growth or shrinkage. In contrast to normal dynamic microtubules, which have a half-life of 5–10 minutes, the captured microtubules can last for hours. This idea is commonly known as "the search and capture" model. Indeed, work since then has largely validated this idea. At the kinetochore, a variety of complexes have been shown to capture microtubule (+)-ends. Moreover, a (+)-end capping activity for interphase microtubules has also been described. This later activity is mediated by formins, the adenomatous polyposis coli protein, and EB1, a protein that tracks along the growing plus ends of microtubules. The process of adding or removing monomers depends on the concentration of αβ-tubulin dimers in solution in relation to the critical concentration (Cc), which is the equilibrium constant for the dissociation of the dimers at the end of the microtubule. If their concentration is greater than the Cc the microtubule will polymerize and grow. If the concentration is less than Cc then the length of the microtubule will decrease. The Cc will vary depending on whether a cap of GTP or GDP is present, which in turn means that the (+) end will have a different value from the (-) end. In the same way that actin filaments grow, the (+) end is defined as the end where preferential growth occurs. The dynamic activity at the (+) end is greater as it has a lower specific Cc. With αβ-tubulin levels greater than the Cc the dimers will mainly accumulate at the (+) end. When the αβ-tubulin concentration is greater than the Cc of the (+) end but below that of the (-) end growth will only occur in one direction, with subunits being added to one end and subunits dissociating from the other end. The microtubule can, therefore, grow at both ends or only at one, depending on the concentrations of αβ-tubulin dimers. The interaction of the (-) end with MTOC will greatly decrease its activity. These characteristics are derived from the existence of the microtubule’s dynamic instability, which means that in the same cell some microtubules are depolymerizing (catastrophe) and others are polymerizing (recovery). They are also called τ(tau) proteins. They line the microtubule and form links with adjacent microtubules. There are four known types of the heavier molecular weight MAPs: MAP-1, MAP-2, MAP-3 and MAP-4. MAP-1 proteins are a set of three different proteins: A, B and C. The C protein plays an important role in the retrograde transport of vesicles and is known as cytoplasmic dynein. MAP-2 proteins are located in the dendrites and in the body of neurons, where they bind with other filaments. The MAP-4 proteins are found in the majority of cells and they stabilize the microtubules. Novel MAPs that bind the length of the microtubules, just like classic maps. Examples include STOP (also known as MAP6), and ensconsin (also known as MAP7). Plus end tracking proteins, which bind to the very tip of growing microtubules. Examples include EB1, EB2, EB3, p150Glued, Dynamitin, Lis1, CLIP170, CLIP115, CLASP1, and CLASP2. A great number of drugs are able to bind to tubulin and modify its activation state. This will have the effect of interfering with microtubule dynamics. These drugs can have an effect at intracellular concentrations much lower than that of tubulin. This interference with microtubule dynamics can have the effect of stopping a cell’s cell cycle and can lead to programmed cell death or apoptosis. However there is data to suggest that interference of microtubule dynamics is insufficient to block the cells in mitosis. These studies have demonstrated that suppression of dynamics occurs at concentrations lower than those needed to block mitosis. Suppression of microtubule dynamics by tubulin mutation or by drug treatment inhibited cell migration. Both microtubule stabilizers and destabilizers can suppress microtubule dynamics. The cancer-fighting taxane class of drugs (paclitaxel, [taxol] and docetaxel) block dynamic instability by stabilizing GDP-bound tubulin in the microtubule. Thus, even when hydrolysis of GTP reaches the tip of the microtubule, there is no depolymerization and the microtubule does not shrink back. The Epothilones, e.g. Ixabepilone, work in a similar way to the taxanes. Nocodazole, vincristine, and Colchicine have the opposite effect, blocking the polymerization of tubulin into microtubules. Eribulin binds to the (+) growing end of the microtubules. Eribulin exerts its anticancer effects by triggering apoptosis of cancer cells following prolonged and irreversible mitotic blockade. Expression of β3-tubulin makes cells more aggressive by altering their response to drug-induced suppression of microtubule dynamics. In general the dynamics are normally suppressed by low, subtoxic concentrations of microtubule drugs that also inhibit cell migration. However, incorporating β3-tubulin into microtubules increases the concentration of drug that is needed to suppress dynamics and inhibit cell migration. Thus, tumors that express β3-tubulin are not only resistant to the cytotoxic effects of microtubule targeted drugs, but also to their ability to suppress tumor metastasis. Moreover, expression of β3-tubulin also counteracts the ability of these drugs to inhibit angiogenesis which is normally another important facet of their action. Microtubule polymers are extremely sensitive to various environmental effects. Very low levels of free calcium can destabilize microtubules and this prevented early researchers from studying the polymer in vitro. Cold temperatures can also cause rapid depolymerization of microtubules. Detyrosination: the removal of the C-terminal tyrosine from alpha-tubulin. This reaction exposes a glutamate at the new C-terminus. As a result, microtubules that accumulate this modification are often referred to as Glu-microtubules. Although the tubulin carboxypeptidase has yet to be identified, the tubulin—tyrosine ligase (TTL) is known. Delta2: the removal of the last two residues from the C-terminus of alpha-tubulin. Unlike detyrosination, this reaction is thought to be irreversible and has only been documented in neurons. Acetylation: the addition of an acetyl group to lysine 40 of alpha-tubulin. This modification occurs on a lysine that is accessible only from the inside of the microtubule, and it remains unclear how enzymes access the lysine residue. The nature of the tubulin acetylase remains controversial; however, the reverse reaction is known to be catalyzed by HDAC6. Polyglutamylation: the addition of a glutamate polymer (typically 4-6 residues long) to the gamma-carboxyl group of any one of five glutamates found near the end of alpha-tubulin. Enzymes related to TTL add the initial branching glutamate (TTL4,5 and 7), while other enzymes that belong to the same family lengthen the polyglutamate chain (TTL6,11 and 13). Polyglycylation: the addition of a glycine polymer (2-10 residues long) to the gamma-carboxyl group of any one of five glutamates found near the end of beta-tubulin. TTL3 and 8 add the initial branching glycine, while TTL10 lengthens the polyglycine chain. Tubulin is also known to be phosphorylated, ubiquitinated, sumoylated, and palmitoylated. In addition to movement generated by the dynamic instability of the microtubule itself, the fibres are substrates along which motor proteins can move. Some proteins take advantage of the hydrolysis of ATP in order to generate mechanical energy and move substances along the microtubules. The major microtubule motor proteins are kinesin, which moves toward the (+) end of the microtubule, and dynein, which moves toward the (−) end. 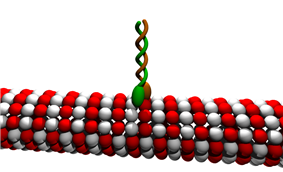 A kinesin molecule bound to a microtubule. The majority of the kinesins are involved in the transport of vesicles from a microtubule’s (-) end toward the (+) end, that is toward the distal part of a cell or neurite. Some viruses (including retroviruses, herpesviruses, parvoviruses, and adenoviruses) that require access to the nucleus to replicate their genomes attach to the motor proteins (dynein), which transport them at 1-4 μm/s to the centrosome, near the nucleus. Microtubules play a part in biological processes in addition to their structural role as a component of the cytoskeleton (along with actin and the intermediate filaments). The cytoskeleton formed by microtubules is essential to the morphogenetic process of an organism’s  This involvement in the body’s architecture is also seen in mammals. Another area where microtubules are essential is the formation of the nervous system in higher vertebrates, where tubulin’s dynamics and those of the associated proteins (such as the MAPs) is finely controlled during the development of the brain's neuronal base. The cellular cytoskeleton is a dynamic element that functions on many different levels: In addition to giving it a particular form and supporting the transport of vesicles and organelles, it can also influence gene expression. However, the signal transduction mechanisms involved in this communication are little understood. Notwithstanding this, the relationship between the drug-mediated depolymerization of microtubules and the specific expression of transcription factors has been described, which has provided information on the differential expression of the genes depending on the presence of these factors. This communication between the cytoskeleton and the regulation of the cellular response is also related to the generation of growth factors: for example, this relation exists for connective tissue growth factor. This fact has a vital inconsistency in cancer treatments as paclitaxel (sold under the trademark taxol, a widely used antineoplastic drug) acts on cytoskeletal microtubules, and it is their interaction with elements that regulate the cell cycle that provokes, in the presence of antineoplastic drugs, a series of cellular failures in the cancerous cells that lead to planned cell death or apoptosis. Recently, single microtubule is isolated and its electronic properties are measured using state of the art nano-probe technique, in an extremely noise free environment. Microtubules are electrical insulators (~300 mega Ohms), however, at particular ac frequencies, the dc conductivity decreases several orders of magnitude to a few kilohms. These frequencies are termed as electromagnetic resonance frequency. Sahu et al exhibited multi-level memory switching properties storing as much as ~500 bits, reversible switching like Random Access Memory (RAM) devices. Single molecule multi-level memory switching is an advanced atomic scale measurement technique, which exhibits massively parallel computing. By controlled spectroscopic and microscopic measurement using Raman spectroscopy and Transmission Electron Microscopy(TEM) it is demonstrated that the ripples of energy flowing through tubulin proteins condense into a few vibrational peaks, the energy condensation into Raman peaks is abundant in several materials, but not in many biomaterials. Most importantly the coherent oscillations observed in TEM disappears, as soon as the water channel is taken out from single microtubule core. Complete resonance band or all ac frequencies at which there is a substantial decrease in the electrical resistance of the single tubulin protein molecule and single microtubule molecule has been determined. Here we copy the resonance frequencies from the published manuscript. A single Tubulin acts just like a single molecule oscillator, has three resonance bands (10^7 ~ 10^13 Hz, gap in order ~6) Triplet 1 (80–140 MHz, 180–250 MHz, 300–400 MHz); Triplet 2 (12–18 GHz, 25–50 GHz, 100–300 GHz), Triplet 3 (2–20 THz, 22–30 THz, 35–60 THz). Here 5-15THz is inaccessible THz band, wherein for a long time we had a technological gap. A single microtubule, acts just like a single molecule oscillator, the frequency ranges of three resonance bands are (10^4 ~ 10^10 Hz, gap in order ~6) Triplet 1 (15–20 kHz, 25–80 kHz, 100–300 kHz), Triplet 2 (10–19 MHz, 20–40 MHz, 100–228 MHz), Triplet 3 (1–5 GHz, 7–10 GHz, 15–30 GHz). ^ Li J, Shariff A, Wiking M, Lundberg E, Rohde GK, Murphy RF. 2012. Estimating microtubule distributions from 2D immunofluorescence microscopy images reveals differences among human cultured cell lines. PLoS ONE 7(11): e50292. ^ Vale RD (Feb 2003). "The molecular motor toolbox for intracellular transport.". Cell 112 (4): 467–80. ^ Howard J; Hyman AA; (Feb 2007). "Microtubule polymerases and depolymerases.". Curr Opin Cell Biol 19 (1): 31–5. ^ a b c Weisenberg RC (1972). "Microtubule formation in vitro in solutions containing low calcium concentrations". Science 177: 1104–5. ^ Walker RA, O'Brien ET, Pryer NK, Soboeiro MF, Voter WA et al. (1988). "Dynamic instability of individual microtubules analysed by video light microscopy: rate constants and transition frequencies". J. Cell Biol 107: 1437–48. ^ Chrétien D, Metoz F, Verde F, Karsenti E, Wade RH. Lattice defects in microtubules: protofilament numbers vary within individual microtubules J Cell Biol. 1992 Jun;117(5):1031-40. ^ Desai A.; and Mitchison TJ; (1997). "Microtubule polymerization dynamics.". Annu Rev Cell Dev Biol 13: 83–117. ^ Karp, Gerald (2005). Cell and Molecular Biology: Concepts and Experiments. USA: John Wiley & Sons. p. 355. ^ Weisenberg RC, Deery WJ, Dickinson PJ (September 1976). "Tubulin-nucleotide interactions during the polymerization and depolymerization of microtubules". Biochemistry 15 (19): 4248–54. ^ Mitchison T, Kirschner M (1984). "Dynamic instability of microtubule growth". Nature 312 (5991): 237–42. ^ Kirschner M, Mitchison T (May 1986). "Beyond self-assembly: from microtubules to morphogenesis". Cell 45 (3): 329–42. ^ Cheeseman IM, Desai A (January 2008). "Molecular architecture of the kinetochore-microtubule interface". Nature Reviews Molecular Cell Biology 9 (1): 33–46. ^ a b Infante AS, Stein MS, Zhai Y, Borisy GG, Gundersen GG (November 2000). "Detyrosinated (Glu) microtubules are stabilized by an ATP-sensitive plus-end cap". Journal of Cell Science 113 (22): 3907–19. ^ Palazzo AF, Cook TA, Alberts AS, Gundersen GG (August 2001). "mDia mediates Rho-regulated formation and orientation of stable microtubules". Nature Cell Biology 3 (8): 723–9. ^ Wen Y, Eng CH, Schmoranzer J, et al. (September 2004). "EB1 and APC bind to mDia to stabilize microtubules downstream of Rho and promote cell migration". Nature Cell Biology 6 (9): 820–30. ^ Ganguly, A; Yang, H; Cabral, F (2010). "Paclitaxel-dependent cell lines reveal a novel drug activity". Molecular cancer therapeutics 9 (11): 2914–23. ^ Yang, Hailing; Ganguly, Anutosh; Cabral, Fernando (2010). "Inhibition of Cell Migration and Cell Division Correlates with Distinct Effects of Microtubule Inhibiting Drugs". The Journal of Biological Chemistry 285 (42): 32242–50. ^ Ganguly, A; Yang, H; Cabral, F (2011). "Class III β-tubulin counteracts the ability of paclitaxel to inhibit cell migration.". Oncotarget 2 (5): 368–377. ^ a b Janke C, Bulinski JC (December 2011). "Post-translational regulation of the microtubule cytoskeleton: mechanisms and functions". Nature Reviews Molecular Cell Biology 12 (12): 773–86. ^ a b c Garnham CP, Roll-Mecak A (July 2012). "The chemical complexity of cellular microtubules: tubulin post-translational modification enzymes and their roles in tuning microtubule functions". Cytoskeleton 69 (7): 442–63. ^ Ersfeld K, Wehland J, Plessmann U, Dodemont H, Gerke V, Weber K (February 1993). "Characterization of the tubulin-tyrosine ligase". The Journal of Cell Biology 120 (3): 725–32. ^ Paturle-Lafanechère L, Eddé B, Denoulet P, et al. (October 1991). "Characterization of a major brain tubulin variant which cannot be tyrosinated". Biochemistry 30 (43): 10523–8. ^ Hubbert C, Guardiola A, Shao R, et al. (May 2002). "HDAC6 is a microtubule-associated deacetylase". Nature 417 (6887): 455–8. ^ Audebert S, Desbruyères E, Gruszczynski C, et al. (June 1993). "Reversible polyglutamylation of alpha- and beta-tubulin and microtubule dynamics in mouse brain neurons". Molecular Biology of the Cell 4 (6): 615–26. ^ van Eeden F, St Johnston D (August 1999). "The polarisation of the anterior-posterior and dorsal-ventral axes during Drosophila oogenesis". Current Opinion in Genetics & Development 9 (4): 396–404. ^ Beddington RS, Robertson EJ (January 1999). "Axis development and early asymmetry in mammals". Cell 96 (2): 195–209. ^ Tucker RP (1990). "The roles of microtubule-associated proteins in brain morphogenesis: a review". Brain Research. Brain Research Reviews 15 (2): 101–20. ^ Rosette C, Karin M (March 1995). "Cytoskeletal control of gene expression: depolymerization of microtubules activates NF-kappa B". The Journal of Cell Biology 128 (6): 1111–9. ^ Ott C, Iwanciw D, Graness A, Giehl K, Goppelt-Struebe M (November 2003). "Modulation of the expression of connective tissue growth factor by alterations of the cytoskeleton". The Journal of Biological Chemistry 278 (45): 44305–11. ^ Chen JG, Yang CP, Cammer M, Horwitz SB (November 2003). "Gene expression and mitotic exit induced by microtubule-stabilizing drugs". Cancer Research 63 (22): 7891–9. ^ Sahu, S., Ghosh, S., Ghosh, B., Aswani, K., Hirata, K., Fujita, D., Bandyopadhyay, A., Atomic water channel controlling remarkable properties of a single brain microtubule: Correlating single protein to its supramolecular assembly, Biosensors and Bioelectronics 2013 47, 141–148.